Thomas Richardson had acquired the Hartlepool Iron Works in 1847 and this bridge lintel is dated 1851. Although it doesnt appear to be structural as the surround bridge is much newer. A friend at Network Rail informs me there is a 1940 steel deck built from old rails that carries no tracks. The live line are carried by a modern steel slab deck installed in 1989. This pillbox is stranded in a gated housing development at the southern corner of the golf course. It looks like all the opening have been blocked, but it cannot be approached for a closer look. The area to the North-West of Hartlepool seems to have been a heavily defended during World War 2. Here is another example of a pillbox in that area, although sadly this one is sealed up and covered in grafiti. Here’s a modern oddity for you, a house in Hartlepool that’s been coated with aluminum beer cans. The story goes that a gentleman called Phil Musspratt started off with just a wall in the garden, but its now spread over the whole house. Ralph Ward Jackson (7 June 1806 – 6 August 1880) was the founder of West Hartlepool and was the towns first MP in 1868. It was donated by Colonel J. W. Cameron, the founder of Camerons brewery to mark the jubilee of the opening of the towns first dock and harbour. 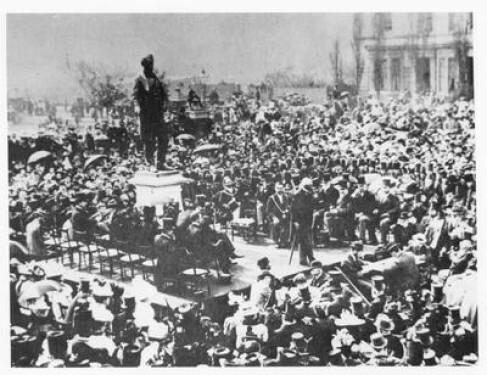 The statue was unveiled on 12th June 1897 by the Marquis of Londonderry.